A couple of weeks ago I went to see an exhibition at the Japan Society of one of my favorite artists, Utagawa Kuniyoshi. Truth is, I am in awe of many of the artists from the Ukiyo-e period, especially Kitigawa Utamaro. The sophistication of vision and the clarity and speed of execution in these artists’ work is fascinating. But what is really interesting to me is the emotional impact of many of the images themselves – the way they involve you, intimately, in what is being represented. It is a vision determined through direct drawing, memory and touch, then reproduced using woodblock printing techniques. Woodblock printing! Christ, most of us have NO CLUE how labor intensive and difficult this is. Images are backwards, you must work from the negative and the entire thing is hand carved – meaning it takes great skill and technique to do it well. In order to make a line you must remove the material around the line. Not only is it laborious, but you have to think from the end rather than work to the end – making the whole process even more conceptually driven. 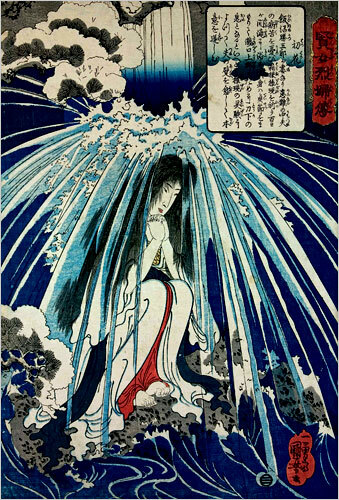 Kuniyoshi is a marvelous story teller and a brilliant technician. His work is about movement and drama – theatrical in the best sense. The exhibitors had placed an open sketch book of his drawings at the beginning of the galleries. The page of drawings on view were stunning – all process and reworked lines. In this sketch book the creative act was on view, and it looked extremely contemporary. But what really took me aback was the strength of the line, the sureness of the execution. When he decided on something he was emphatic. We don’t draw like that any longer, unless we are tracing an image. Oh, we play the drawing game, sure, but it is removed from the act of seeing. By that I mean we start the drawing knowing that we’re going to erase it, smear it, work the paper, tear into the surface. Our drawing is about the processes of working the drawing rather than involving ourselves in forming an image, and this “process” has become an academic/institutional preoccupation in so many studios. We don’t look or see our way to moving a line; we process the line, we distress and/or antique the paper, we concentrate on the effect of the materials. So, it’s always wonderful to see and be reminded of real visual thought in action – ideas pushing the image into view through the artist’s hand. You get a real jolt of this difference in our time and in this sketch book. But there were even more delights on the walls! 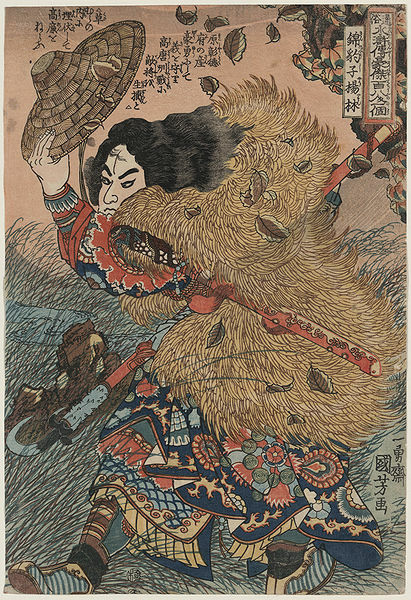 Kuniyoshi was a master of technique and his work is dramatic, cinematic and way OTT. But for me it is his composition that is divine – in piece after piece he drives you straight into the visual sweet spot – pushing and pulling the rising subject through the ground. There were just a few people in the galleries, a couple of wonderfully tatooed Manga fans drawing copies, an old couple discussing their trip to Tokyo and a family pointing out the minute details of each print to their totally bored nanny. Basically, I had the place to myself and I spent a bit of time going back and forth between the images. One of my favorites was the image on the left. The linework is incredible and it literally enervates the entire image. Everything in the piece is moving. The wind is blowing life around the figure, leaves, clothing, hair, all of it in motion. The line IS process, like DeKooning’s brush strokes, but here, conceptualized for vision, bringing the rising subject into sharp visual focus. The figure struggles against the heavy wind, his left foot about to step into our space, as if he is leaving the frame. The long grass moves in waves, leaves blow across the glade. You get a strong sense of fall, of the chill in the air, like late October. This figure has a purpose and is resolved to move forward – the rather nasty looking hook and tether in his right hand allude to some serious goings-on. But what I truly love are the textures that Kuniyoshi has created using only line – short bursts, long flows, thick stubs, long razor-like shards, all of it designed to move your eye – the silk of the robes, the thick fur of his cloak, the landscape, the dried leaves, the woven hat. Van Gogh did a very similar thing with line in his drawings and paintings, and he appropriated the power of these techniques from the Japanese woodcut prints that were all the rage amongst the Parisian avant garde of the time. As I was leaving the show I wondered why our drawing practices today have little in common with the visual feast going on in those galleries. I have grown tired of the naive ham handedness and itchy scratchy line or the singleminded pursuit of the “badly made piece” that passes for “expression.” I want more sophistication in drawing. Sophistication that isn’t based on academic posturing or lens based “reality.” I don’t care about verisimilitude, especially if it’s clumsy, but I do care for understanding and simplicity – like Ingres’, Delacroix’s or Michelangelo’s drawings. Picasso was a master of technique, and he would use that mastery to get at and simplify his vision. A good friend of mine used to say that Matisse was dangerous with a nib, like a deadly fencer, and with just a few quick flicks of his wrist an odalisque would appear. I thought about this as I made my way back to the subway. A lot of gallery shows these days like to show off a wall of drawings to go with the paintings on view, and I’m always struck at the wierd disparity between those drawn works and the paintings. I think this is so for two reasons. First, drawing is an intimate visual experience connected to thought. Most of us do not experience visual thought in this way any longer – we prefer to lens capture on our phones and airbrush with an app. We do not see in a physical sense – we conceptualize through lenses and programs. Robert Hughes used to complain that the Postmoderns couldn’t draw and in this sense he was correct – we have been concerned with processes. The second (and probably a reaction to the first) is our reliance on materials and the effects that they can produce. There are many painters who are wonderful technicians and materialists. They can move “stuff” – dripping, erasing, scraping, sanding and scumbling the work with torrents of physically pliable things. They are creating effects and backgrounds – and it happens in both painting and drawing. But what is left out of this process is seeing the world around us. When the Parisian avant garde went nuts for Japanese prints it opened them up to new ideas about composition, flatness and visual economy. For Van Gogh these prints challenged him to change his ideas about the way his hand worked, the way his drawing techniques could express an emotion through vision. For me, when I go back to see the Japanese masters, I see the movement, the linework and the visceral pictorial composition as a way to enliven and engage our media saturated scanning eyes. If you can, I suggest you find an afternoon for Kuniyoshi.